(Nanowerk News) What's a few protons, one way or another? A great deal, according to Dr. Morris Bullock and Dr. Monte Helm at Pacific Northwest National Laboratory scientists in their invited review article. While protons are often ignored in favor of smaller and faster electrons, protons actually play a big role in reactions vital for energy storage and use. And, either the protons can be relayed along to quickly get energy from a reaction, or they can slow the reaction to a crawl. Shoving the protons around with ligands, which behave like octopus arms, scientists at the at the Center for Molecular Electrocatalysis can create a catalyst that is fast and efficient and uses iron, nickel, or other metals instead of platinum, a more typically used but expensive and rare metal. Bullock and Helm reviewed the catalysis research at the Center for Molecular Electrocatalysis, where Bullock is the director, in a recent article in Accounts of Chemical Research ("Molecular Electrocatalysts for Oxidation of Hydrogen Using Earth-Abundant Metals: Shoving Protons Around with Proton Relays"). Serving as prototypes. In addition to being of interest for energy applications, these reactions are prototypical systems that will allow scientists to explore how electrocatalysts must evolve to perform increasingly complex processes. To halt carbon emissions that heat the atmosphere and to wean us away from reliance on fossil fuels, the world needs a sustainable source of energy that doesn't rely on carbon. Two attractive sources are the sun and the wind, but energy generated from these renewable sources must be stored because of the mismatch between when and where it's generated compared to when and where it's needed. Storing that energy in chemical bonds is one option. Those bonds can then be broken to power fuel cells. Inside the fuel cell, a catalyst generally made from platinum breaks apart the hydrogen and "releases" electrons that serve as energy sources. Scientists have been attempting to build a catalyst using metals that are more abundant and less expensive so the catalyst can be used on a wider scale. "Nature actually provides us with a remarkably efficient model," said Helm. "Using more abundant iron or nickel instead of platinum could allow us to store more energy at less cost." Scientists has been developing molecular electrocatalysts for the oxidation of hydrogen, a common process in fuel cells, which could use hydrogen fuel created from renewable energy. The oxidation reaction process results in breaking apart hydrogen into two electrons and two protons. Scientists at the Center for Molecular Electrocatalysis are fine-turning design guidelines for shoving the two protons around. 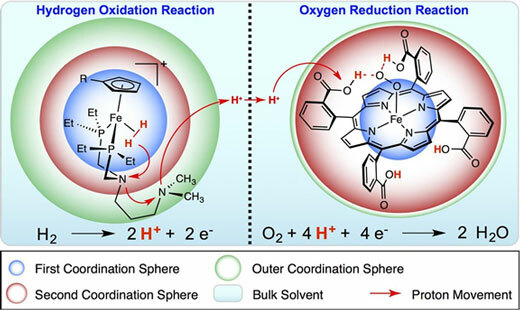 While tearing apart even a small molecule like hydrogen may seem difficult enough, controlling the oxidation to create an energy-efficient reaction is even more challenging. It required the scientists to develop functional models of the process and then properly position the atoms. For example, CME scientists experimented with several chemical variations of proton relays before finding the optimum approach. "Anyone who's ever heard the loud, room-shaking sound in a lecture hall when a flame ignites a balloon full of hydrogen and oxygen can vouch for the energy content and easy release of the hydrogen bond," said Bullock, Laboratory Fellow at PNNL. Scientists around the world, including those at PNNL, will continue using the principles described in this review to design molecular electrocatalysts with earth-abundant metals. Their work can potentially guide efforts to store and retrieve energy from other chemical reactions required for the production and utilization of renewable energy as well.